Where can we purchase tickets? How much are tickets prices? We have the answers and also list tips for the event. Look below! Be inspired by the Parade of Homes! Below are some tips and ideas that will make your visit even more enjoyable. Have Fun! You are in someone else’s neighborhood when you tour. Be sure to honor the no-parking areas and do not block driveways or drive on lawns. Try to leave at least two car widths for passing traffic. Some builders are flattered if you take photos or measurements. Others would prefer that you refrain from taking photos. Please ask permission before you begin. Be sensitive to other people visiting the home at the same time by not obstructing their view. We are hoping free admission for kids provides a good family atmosphere for you to tour. For their safety, and for the pleasure of others touring, please keep children near you at all times. COMMENTS ABOUT THE HOME Homeowners may be on site, so please refrain from making comments. Keep your observations positive while in the homes. and at homes on the tour. Please Note: One ticket per person is good for all homes on the tour during event dates and times. Looking for a way to give back to the community on behalf of your company? 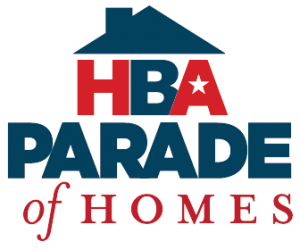 Your employees can volunteer to staff the Parade of Homes in the Spring or Fall, and the HBA will designate your donation to a local nonprofit of your choice!